PowerBASIC Forms offers a complete design environment, even a menu editor, tab order editor, and version resource editor. To start, first open a dialog and size it to your needs. Add a few controls, choose the fonts, select the colors, add menus, accelerators, short-cuts, and you’re well on your way. Then generate your template and start adding code. You can use instant Test Mode to view the final design, even before you compile it. You can just reopen the project if you need to add a control or change a size or style. You can even create a completely new template from your modified project. Program help is available right at your fingertips. Click a style, see an instant definition. The onscreen help is so extensive, so there’s no need to read a manual! You can reuse previous work done in creating Visual Basic forms, Visual Studio resources, even hand-written DDT with PB/DLL or PBWin. With just a few clicks, you can import all your work, ready to compile and execute. PB/Forms lets you save your favorite combinations of dialogs and control styles. Choose some style attributes and view the result in Test Mode. Then you can name the style, and for later reuse. Even better, a favorite can be chosen as the default size and style for each type of control and dialog. Creating menus is greatly simplified with PB/Forms’ built-in menu editor. Just type the text for each menu caption, and ID names are created for you. Separator bars and popup sub-menus are as easy as choosing a radio button. If you know Visual Basic, you’ll find the Menu Editor familiar, yet a welcome relief — in fact, you’ll design menus in a fraction of the time it took before. You can set up accelerators (shortcut keys) and easily link menus to a dialog box. PB/Forms’ Tab Order Editor displays a small yellow numbered box in the upper-left corner of each control. Click controls in sequence, and the numbered boxes update. Re-order the entire dialog or a few controls, quickly and easily. PB/Forms generates simple “helper functions” to handle menial tasks like populating a Listview or Treeview control. It even creates sample code to help manage ListBoxes, ComboBoxes, Treeviews, Listviews, and others. 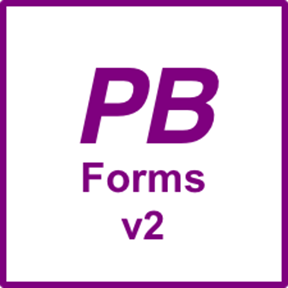 All of your images, bitmaps, icons and version resources are automatically embedded in PowerBASIC Forms. This simplifies your code while guaranteeing a single compact executable. Strings for a status bar or tooltips for a toolbar are auto-saved and embedded in the same final resource. PowerBASIC Forms 2.0 has been completely updated to support the new DDT commands in PowerBASIC 9 For Windows. Listview, Treeview, Progressbar, Statusbar, and Tab controls have all been updated. A new Toolbar control has been added to Toolbox with sample code to show how to add buttons with images. Fonts are now handled with CONTROL SET FONT, FONT NEW, and FONT END. #INCLUDE and #IF %DEF() metastatements have been updated to use the new #INCLUDE ONCE metastatement to ensure that no redundant code is added to the application. Callbacks have been updated to support the new CB functions. Also new is the ability to enable visual styles using a manifest file that is embedded in an application resource file. PowerBASIC Forms 1.5 and 2.0 are 32 bit applications and are compatible with 64 bit versions of Windows.